CreditRiskMonitor uses all that data to assign a proprietary rating, called a "FRISK" score, that weighs the probability of bankruptcy. A FRISK score of one indicates a 9.99% to 50% chance of bankruptcy within 12 months, and a score of two corresponds with a 4% to 9.99% chance of bankruptcy. The scores continue to 10, which indicates risk near zero. While CreditRiskMonitor issues scores for a large chunk of major retailers, many companies don't have a FRISK score. David's Bridal, for instance, never appeared on our list, though the retailer missed a debt payment in October and filed for bankruptcy in November 2018. The following was culled from lists of retailers with FRISK scores of one or two as of March 22. It's not a definitive count — Blue Apron and Steinhoff International Holdings, the owner of Mattress Firm (which filed for bankruptcy in October) — also have FRISK scores of two, though you won't see an in-depth look at them below. Neiman Marcus has put together a string of relatively healthy quarters, recently posting its sixth consecutive quarter of comparable store sales growth. To boost profit and sales, the company cut jobs and developed a "Digital First" strategy in 2017 to engage customers more deeply. And last year, it introduced a new turnaround plan that aims to drive $5 billion in total sales and $700 million in adjusted EBITDA within five years. But the company's debtholders have been restless over a long-term debt load of roughly $4.46 billion still dragging it into the red. Early in March, Neiman Marcus said it reached a proposed financial agreement with its lenders that put MyTheresa on the table as collateral for some of the debt. MyTheresa, which the luxury department store retailer positioned as the "highest quality business model in online luxury," became a central point of conflict when it was shuffled to a separate part of the business. One lender who wasn't a part of the talks, Marble Ridge, had filed a lawsuit claiming the company intentionally transferred the MyTheresa business out of the reach of creditors. But a judge recently dismissed the case, concluding that the lawsuit lacked "subject matter jurisdiction." In 2017, Neiman Marcus, held by a group of private equity firms, reportedly talked with Hudson's Bay about an acquisition and also floated plans for an IPO that never materialized. In January of last year, CEO Karen Katz, who had served in the chief executive spot since 2010, stepped down and was succeeded by Ralph Lauren executive Geoffroy Van Raemdonck. The company has also seen turnover in other notable positions including iLab founder Scott Emmons, Chief Merchandising Officer Jim Gold and Fashion Director Ken Downing who all departed this year. J. Crew underwent a massive expansion and tried to go upscale as consumers were changing their tastes and spending habits. The result: the departure of longtime CEO Mickey Drexler (and the one after him) followed by Drexler's retirement from the position of chairman of the board, as well as disappointing financial results. Madewell continues to buoy J. Crew and the retailer is saddled with a $1.705 billion debt problem (slightly less than the $1.714 billion of the year prior). In June of 2017, J. Crew announced it had some relief in the form of a debt exchange. But since then, net losses have continued to plague the company. In its most recent quarter, the retailer's net loss widened to $74.4 million, from a net income of $34.7 million in the year-ago quarter. Net losses for fiscal 2018 were slightly improved, coming in at $120.1 million, compared to $123.2 million the year prior. The J. Crew brand continues to be a problem in the company's portfolio, with sales falling 4% in Q4 2018, while sales at the saving grace Madewell brand increased 16%. Executive turmoil is also likely making it difficult for the retailer to turn around the business. In addition to the absent CEO spot, the company brought in West Elm's creative director, Johanna Uurasjarvi, over the summer to be J. Crew's new chief design officer, but she has since been replaced by Chris Benz, a former J. Crew employee under Jenna Lyons, executives said during a recent conference call with analysts. Still, the company has made several moves over the past year or so to try and get the company back on track, including launching a new loyalty program, extended sizing at Madewell and J. Crew, a men's collection at Madewell and a third-party marketplace. Current executives have pulled back on some of the efforts instituted by former CEO James Brett, including axing the Mercantile and Nevereven brands, which "caused confusion with our customers," according to President and COO Michael Nicholson. Francesca's is in the midst of a tumultuous period, with a string of terrible quarters in fiscal 2018 calling attention to the retailer's financial trouble. So far, the retailer's net sales have decreased every quarter — 7% in the first quarter, 6% in the second and an alarming 10% in the third quarter, which reported in December. Comparable sales at the specialty apparel retailer also tanked by double digits every quarter of fiscal 2018, falling 16% in Q1, 13% in Q2 and 14% in Q3. Currently, the retailer's fourth quarter results are projected to come in March 26, according to Nasdaq, with one analyst's forecast pinning its expected earnings per share at $-0.11. Then-CEO and President Steve Lawrence blamed the retailer's troubles on weak foot traffic, which it hoped to improve through various marketing and merchandising initiatives, but by the third quarter he acknowledged that management "recognize[d] the need to accelerate change and improve results faster." That process evidently led to Francesca's hiring Rothschild & Co, and other advisors, to explore "strategic and financial alternatives" in January, including a possible sale, financing or refinancing. At the same time, Lawrence resigned and was replaced by Michael Prendergast in the interim, a senior director in Alvarez & Marsal's private equity performance improvement retail practice. Rite Aid's quarterly performance has been up and down this year. Fourth quarter revenues for fiscal 2018 fell 8.6%, while retail pharmacy segment sales fell 10.1% and pharmacy services fell 4.3% — trends that have not fully righted themselves. For the company's Q2 earnings in September, the drugstore retailer recorded a same-store sales decline of 0.1% while its retail pharmacy same-store sales increased 1%. More importantly, though, the retailer's second quarter revealed a net loss of $352.3 million, a steep decline from the year-ago period's net income of $188.4 million. Rite Aid has recovered some since then, with third quarter revenues rising from the year-ago period and retail same-store sales rising 1.6% on a 3.1% increase in pharmacy sales and a 1.5% decrease in front-end sales. The new year hasn't been much kinder. The drugstore retailer was warned of its performance on the New York Stock Exchange in January and faces a potential delisting if its stock doesn't improve. The company also cut 400 jobs in March, 20% of its workforce, in addition to CEO John Standley stepping down. Things have been tough for the drugstore retailer for some time now, as its attempt to merge with rival Walgreens was abandoned in 2017 and even the 2,000 stores Walgreens did acquire don't seem to be all that promising. Walgreens in October of last year said that it would be closing 600 of the Rite Aid locations it had acquired. While rumors swirled for a time that Amazon would be a good acquirer for the drugstore retailer, no deal has yet materialized and the company seems to be falling behind CVS and Walgreens, both of which have made efforts recently to invest in popular categories like beauty to help drive sales. Executives have signaled that J.C. Penney's slow-rolling turnaround won't end anytime soon as the retailer once again tries to nail its apparel assortment and inventory levels. In 2018, after a string of disappointing quarters, Marvin Ellison left the CEO spot for Lowe's, further complicating Penney's prospects for a successful about-face in the near future. Replacing Ellison is Jill Soltau, former chief of Joann Stores, who the company hopes can reinvigorate the department store's merchandising. There's been other executive turnover as well, including the chief of finance slot. The retailer, which has $3.7 billion in debt on its books, has axed more than 1,000 jobs and closed a distribution center. With uncertainty hanging over its prospects, Fitch downgraded the retailer's credit rating from B to B- in January, citing the retailer's "significant EBITDA erosion in 2018." The department store retailer also announced in its most recent earnings that the company would be shuttering 18 stores and winding down its Big & Tall subscription. Net sales for the quarter fell 9.5% and comparable sales were down 4%. Net loss for the year widened to $255 million. The list of areas where Pier 1 needs to improve is long. As Jeffries analysts led by Daniel Binder put it in a June note, the company is in for a "heavy investment year" as it addresses "sourcing, merchandising, pricing, marketing, store ops, e-com and supply chain." Net sales in Q3 fell 11.9% year over year, and comparable sales fell by 10.5%, according to a company release. Its net loss narrowed slightly, coming to $50.4 million after widening dramatically — by 555% — to $51.1 million in Q2. At the same time, former CEO Alasdair James stepped down and was replaced by board member Cheryl Bachelder in the interim. The retailer has had a tough couple of months since then as well. In January, Pier 1 was notified by the New York Stock Exchange that it's no longer in compliance with listing criteria, which require an average closing share price of at least $1.00 over a 30-day trading period. Then in March, lenders began organizing amid concerns of the retailer's financial situation and later in the month the retailer hired Kirkland & Ellis, among others, to help with debt restructuring. That's after hiring Credit Suisse in December to help evaluate "a full range of strategic alternatives to enhance shareholder value," according to Debtwire. Ascena's path out of financial trouble has not been straight. On Monday the company announced it’s selling a majority interest in its Maurices discount apparel banner to an affiliate of private equity firm OpCapita LLP for approximately $300 million, according to press releases from both companies. The retailer posted its first positive comps since 2015 this past September, followed by another rise in December. Its most recent quarter, though, was a mixed bag of results across its brands, with Ann Taylor and Loft seeing comps rise by 10%, Justice by 2% and Maurices by 1%, while Dressbarn, Catherines and Lane Bryant fell by 1%, 4% and 8%, respectively. Net loss in the second quarter grew to $71.5 million from a loss of $39.3 million in the year-ago period. It doesn't help matters that the retailer is operating under a debt load of $1.37 billion. That being said, the company's next term loan payment, totaling $22.5 million, isn't due until November of 2020, and Moody's has speculated the retailer still has time to turn things around before then. The company's brands operate in a variety of spaces, but Lane Bryant and Catherines, which operate in the increasingly crowded plus size category, have had a particularly tough time resonating with consumers who, in many cases, don't want to be shunted off to a separate store to get fashionable clothing. The retailer is making efforts to change the image of those brands, though, including a recent move to pair Lane Bryant with influencer Rochelle Johnson. 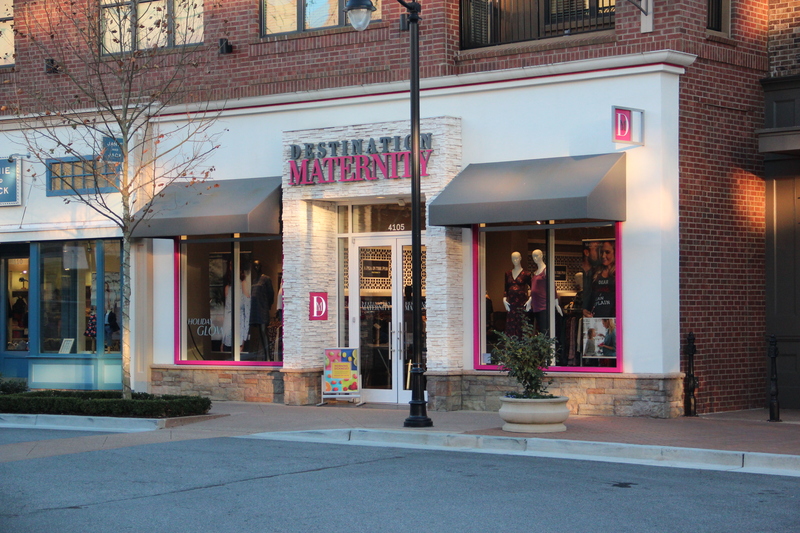 This isn't the first time Destination Maternity has showed up on this list. The specialty retailer has been struggling through a rough patch financially, along with executive turnover. Former CEO Anthony Romano left the company in September of 2017, with an interim CEO who retired a few short months later and was replaced by Melissa Payner-Gregor until the company found a permanent replacement in Marla Ryan. Shortly after the CEO shuffling, though, the company lost its CFO, who had been in the position for two years. In addition to all of the executive turnover, the company's financials have raised concerns from investors and its most recent quarter has not been particularly inspiring. The retailer's sales fell 3.7% to $92.8 million in the quarter, as comparable sales decreased by 2.6%. Net loss improved for the quarter, coming in at $4.1 million, compared to $7.5 million in the year-ago period. The specialty retailer closed 6 stores in the quarter, part of a larger strategic plan at the company. Tailored Brands has struggled for several years. Recent quarterly results have been poor across the company's portfolio. In the fourth quarter, sales fell 9.5% across the company, to $712 million, reflecting sales decreases of 9.6% at Men's Wearhouse, 6.7% at Jos. A. Bank, 7.5% at K&G and 8.8% at Moores. Comparable sales also fell year over year, 1.5% at the company overall, 3.2% at Men's Wearhouse and 0.5% at Jos. A. Bank. Comps at K&G and Moores rose by 0.9% and 2.8%, respectively. The retailer is also battling under a $1.2 billion debt load as of the third quarter, which actually represents a decrease from the year-ago quarter of $231.9 million. The company also made a scheduled $2.3 million payment on its term loan in the fourth quarter and repaid $10 million on its revolving credit facility, according to the release. While comps at many brands were down for the quarter and continue to be down in the first quarter, Tailored Brands Executive Chairman Dinesh Lathi said the brands delivered positive comps for the full year. "We attribute the current softness to both the macro-environment as well as the need for us to execute more quickly and effectively on our core growth strategies: deliver personalized products and services, create inspiring and seamless experiences in and across every channel, and build brands that stand for something more than just price," he said. "Our teams are intently focused on delivering against these objectives in fiscal 2019 as we look to build long-term sustainable value creation for our stakeholders." Stein Mart has been in financial trouble for a few years. The company was on our list a year ago as well, and in January of last year announced it was exploring strategic alternatives with P.J. Solomon as its investment banking and financial advisor. The retailer had previously engaged Alvarez & Marsal to review its operations for performance enhancements. In the retailer's most recent quarter, net sales were down, falling to $340.8 million from $384.9 million in the year-ago quarter. Net sales for the year were also down, falling to $1.26 billion from $1.32 billion the prior year. Stein Mart also has a long-term debt load of $153 million as of the last quarter. Overstock has been trying to sell its e-commerce unit since at least December of 2017 to focus on the company's blockchain trading platform. More recently, Overstock had hoped to sell the business by February, which did not happen. The company's fourth quarter revenues were down 1% to $453 million, but the retailer was able to cut down on net losses by $53.4 million in the quarter, according to a company press release. That being said, Overstock.com still had a $42.3 million net loss for the quarter and $3.07 million of long-term debt. The retailer hasn't been entirely stagnant, though. Overstock.com came out with 17 new private label furniture lines in last May, including 16,000 furniture and home decor products, and also doubled down on its supply chain. In September, the company announced plans for a new warehouse to help fulfill two-day shipping orders and speed up operations. CEO and founder Patrick Byrne referenced the company's blockchain efforts in a statement on the retailer's latest earnings and also acknowledged weaknesses in the e-commerce business. "Our retail arm lost money last year because I gunned things in an attempt to create a conventional high-growth/money losing e-commerce business," he said, "but the losses were nauseating and we reverted back to the philosophy of profitability on which we built Overstock: as a result, in 2019 Retail will return to profitability, generating a positive operating cash flow ≥ $10M." Camping World has had an interesting couple of years. Over 2017 and 2018, the retailer acquired multiple retailers in the outdoor space, including Gander Mountain (now Gander Outdoors), Active Sports and Erehwon Mountain Outfitter, among others. The company's growing interest in the retail space appears to be, in part, due to the cross-selling opportunity it presents. Gander Outdoors has so far been the main player in that strategy, with the retailer planning RV sales at 40 locations by spring of this year. While revenue increased 10.6% in its most recent quarter, the company also posted a net loss of $71.5 million. Retail revenue was also high, increasing 84.7% for the fourth quarter, but same-store sales decreased 3.9% and the company is also staring down a long-term debt pile of $1.15 billion for the quarter.